We spent our last night on the Camino – our twelfth – at the basic but very friendly Rosalia Hotel in Padron. The hotel is right beside the former residence of 19th century writer Rosalia de Castro who today is revered as one of the greatest writers in the Galician language of northwest Spain. Set in a beautiful garden, her small two-storey stone house is now a museum, beautifully maintained and dedicated to her memory. The Galician language is closely related to Spanish and Portuguese. It is given prominence in public signage, in local education and in the mass media of the region. 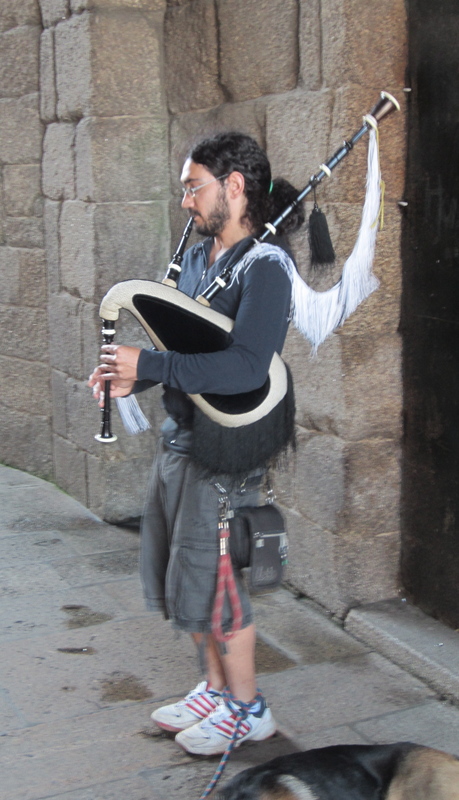 But Galician culture also preserves traces of its primordial Celtic character, most prominently in its Irish-style folk music and in the Galician bagpipes which we first heard as we passed through Redondela during a festival celebrating Galicia’s national day. Approaching Padron that morning we came across a kind of checkpoint manned by two men from a volunteer organisation that helps Camino pilgrims. They were wearing bright orange shirts and police-style boots. Besides providing first aid and pamphlets full of good advice on the perils of long-distance walking, they were also recording statistics on the passing parade of pilgrims. At 11.00 a.m. that day Emmy and I were the 48th and 49th pilgrims to be counted. Their clipboard showed that Spanish pilgrims were easily the majority, followed by Portuguese, Germans, Poles and Italians. We were the only non-Europeans to pass through the checkpoint that day. After a delicious dinner at the Rosalia Hotel that featured a deservedly famous local delicacy, small green pimientos peppers fried in olive oil and served with a touch of salt, we slept so soundly behind the shutters of our room that we almost missed the beauty of the dawn that crept limpid and cool over the shady green park in the centre of town. At 8 o’clock we were standing confused on the edge of town, trying to locate the yellow arrows of the Camino and shading our eyes against a lazily rising sun. We zig-zagged through narrow walled lanes. In one of them a nun, clad in a traditional black habit and white wimple, knelt on the threshold of a street-side door scrubbing the stone step with soap and water. Several times we crossed, and re-crossed, a busy highway and twice darted nervously over a railway line. 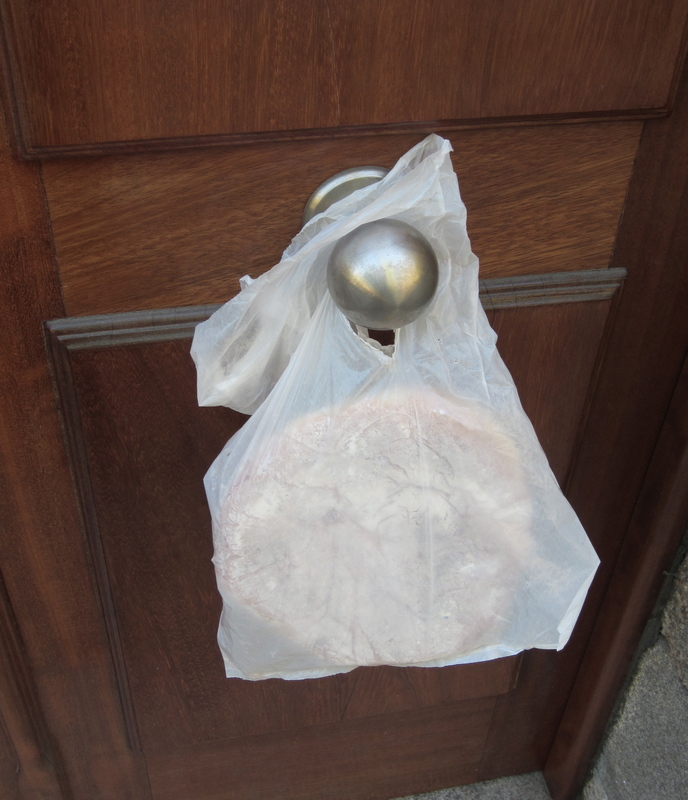 As we moved slowly north towards Santiago the houses became more prosperous-looking, sitting comfortably in neatly maintained flower gardens with bags of bread hanging freshly baked and freshly delivered on gates and doorknobs. The day warmed and we walked into quiet, eucalyptus-tinted woodland. Our boots crunched on fine gravel with tiny grasshoppers jumping among the stones. We tuned in to the thin zing of a forest fly, the ripple of leaves in the wind and the muffled tolling of a distant bell. Five young men on bicycles came powering up a slope behind us, bent low and standing up on their pedals, jamming their legs down hard, yanking their bikes left and right, revelling in their youth and strength. They had signs fixed to the handlebars of their bikes, Camino de Santiago, and they puffed an exultant “Buen Camino!” as they overtook us at the crest of the hill and disappeared. The quietly rustling stillness came back and wrapped its peace around us. We got our first glimpse of the ancient pilgrim city from a bridge across a four-lane freeway. In the distance the suburban houses of Santiago de Compostela clambered across hills and fell sharply into valleys. From our vantage point there was no sign of the spires of the cathedral that, tradition says, have always beckoned pilgrims into the city in the final stage of their walk. Slowly the suburbs lapped around us and we pushed into the city centre along wide streets filled with busy traffic and modern buildings. Like most of the towns we had passed through Santiago de Compostela has a well-preserved historic heart. Its narrow streets were crammed with tourists wandering among the restaurants and souvenir shops. When we looked up we saw only slivers of the afternoon, warm and blue above us. And suddenly we were there, standing in the spacious square before the ornate entrance to the Cathedral of St James. I felt no special emotion apart from an intense curiosity. Emmy and I rested gratefully among the clumps of walkers standing, sitting and lolling – many of them exhausted – across the square. There was no feeling of relief or exultation, but also no feeling of letdown. We had arrived, and there was much to see. After checking in to our small hotel (not far from the cathedral) we set out to explore. We went first to the cathedral. Over the centuries the interior has been embellished and ornamented beyond what the eye can take in. The pipes of the cathedral organ lie horizontal, extending from left and right over the pews. The dramatic and ornate interior of Santiago’s cathedral with its horizontal organ pipes. Above the altar St James presides. A doorway at one side of his image gives access to a cramped stone staircase that leads up to a suffocatingly close space behind the image of the saint. 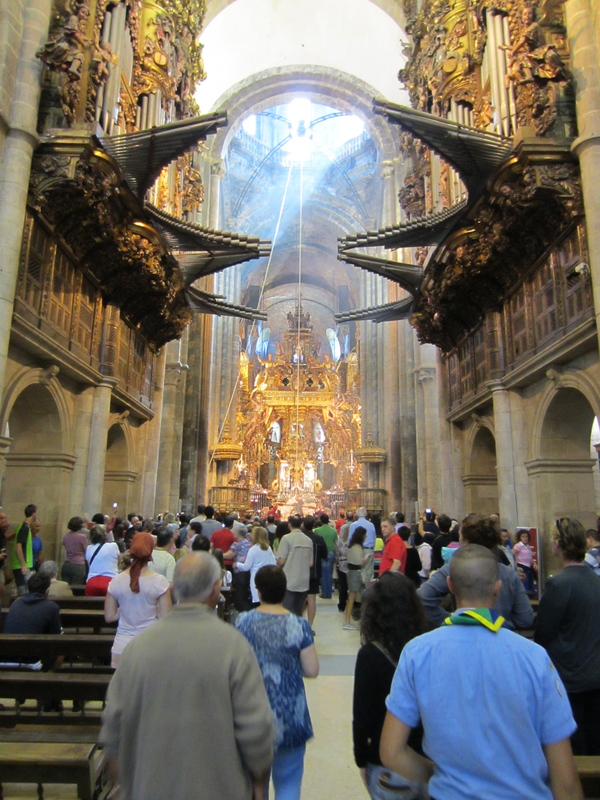 Here, under the supervision of a priest, a shuffling queue of pilgrims squeezes up against the saint’s back. One by one they put their arms around him and press their cheeks against the ornately embossed silver cape that covers his shoulders. They hug him and say a prayer. Reader, I did this too… although as I released St James from my embrace I caught a quizzical glint – perhaps a gleam of scepticism – in the eye of the priest. Another narrow stair-tunnel took us beneath the floor of the cathedral and into the saint’s burial chamber. There, protected by a big pane of glass, lay St James’ shining silver coffin. In front of the window supplicants were kneeling, their hands clasped together and their eyes tightly shut. In a nearby alcove others lit candles. The reverent hush was disturbed only by the ching of coins dropping into donation boxes. Scrunching our eyes against the evening sun we went in search of the Office of Pilgrim Affairs. Through an unassuming archway and up a flight of stairs we arrived at a counter something like a Medicare office. A large illuminated sign hung above us directing us to one of several free places at a long counter in a neighbouring room. The office was quiet when we called and we were served immediately. 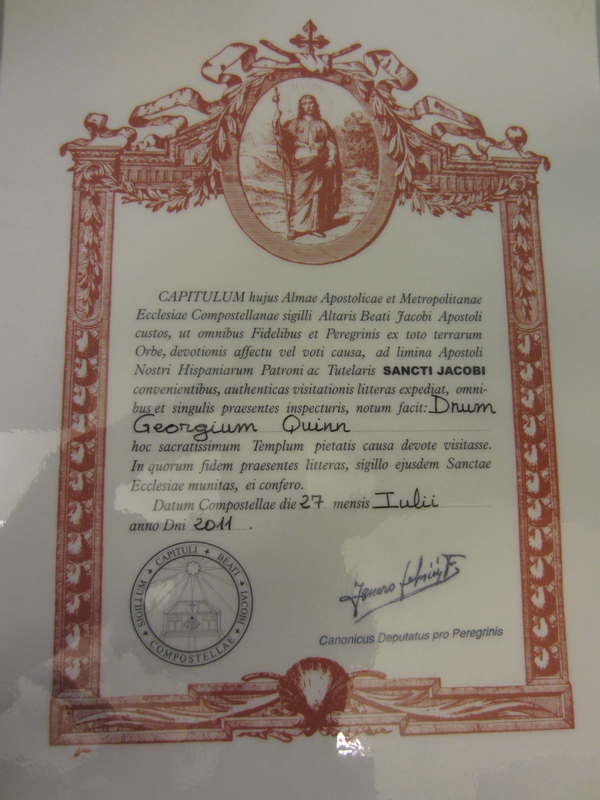 We handed over our pilgrim passports – our credencial – to a church canon who examined them carefully and stamped them with the culminating stamp, that of the Cathedral of Santiago. He then recorded our details in a ledger and a few minutes later he handed us our compostelas. Hmmm, looks like I passed. Georgium Quinn’s compostela. A compostela is a certificate in Latin declaring that the holder has completed the pilgrimage to the most holy temple of Santiago “in a pious and devoted fashion”. My compostela was made out to Georgium Quinn, and I accepted it with a stirring of pleasure garnished with a hint of pride. The officiating canon congratulated me on my faith. [Posted from the New Dungeon Ghyll Hotel in the UK’s Lake District National Park. WHY did you embrace Saint James? WHY do you need to refer to your atheism so often? WHAT heavy price are you now paying for all of this? And how are you surviving, Emmy???? Just let us know if we have to come and rescue you in a rental helicopter! All your questions are good questions, Lois. I’m not sure I can answer them from here in the Post Office in Keswick on a miserably cold and wet (English) summer’s day. 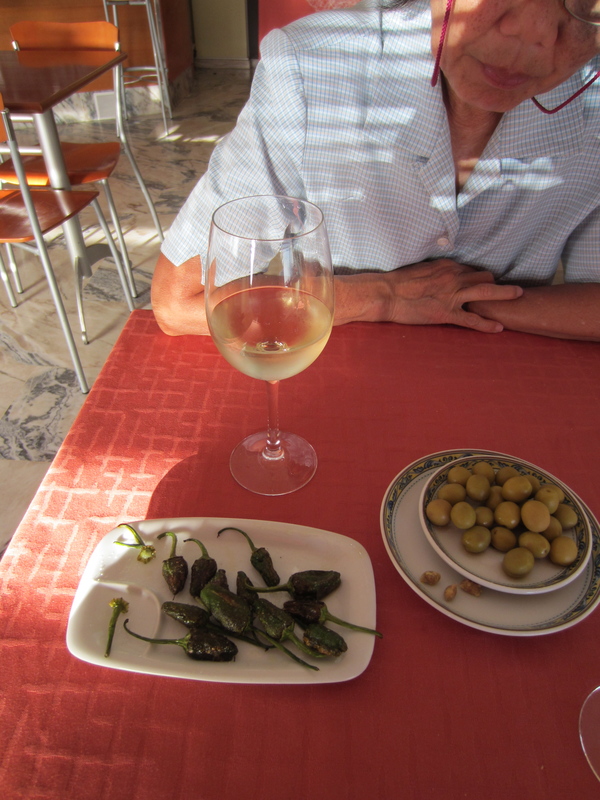 But I will be returning to the Camino experience in a future post, so stay tuned. As we have the same interest of the wonderful Camino de Santiago we would like to share with you useful things to make your Trip better. 	Get a good mobile Application of the Camino providing, Map with monument, Hotel & Restaurant, and Taxis number; but also social media interaction and ground transportation planner. We have also linked up with Hike-Tech.com to allow a unique luggage transfer online booking capability.CAMINO GUIDE provided by Follow the Camino is available in different languages 6 languages on Apple and Android and is FREE. 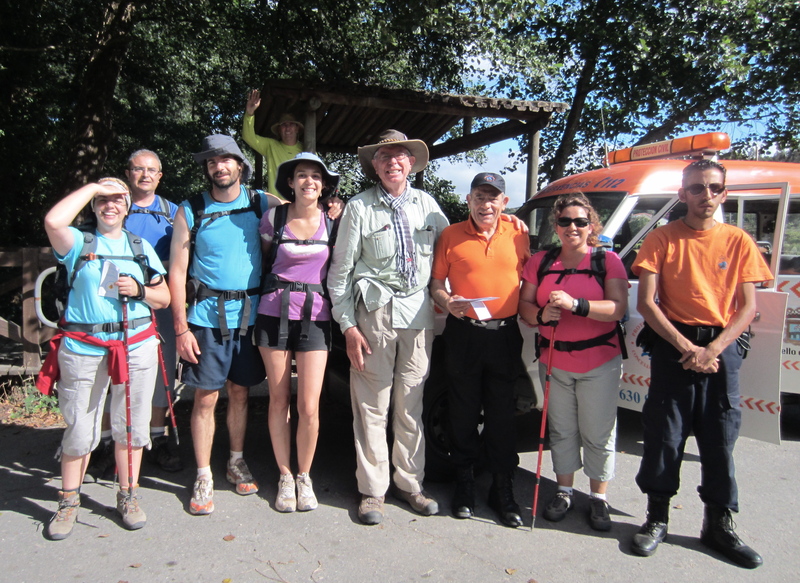 	The second thing if you are not friendly mobile users is to book your luggage transfer before going on the Camino. Hike-Tech booking engine allow booking your luggage transfer in less than 5 minutes when you have your itinerary. Simply your town from/hotel from the Town to/Hotel to, date and number of luggage and here you go  You can book as many stages as you like at once. No need to contact different taxis, we do it for you. Once a booking is made, you will receive a confirmation with the contact details of each taxi transferring your bag(s). So don t stress any more about your luggage and enjoy your Trip on the Camino. In hoping it will be as useful for you as for us.